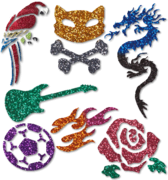 Glitter Tattoos are fun, flashy and fantastic, dahling! The design is ALL GLITTER, so you can’t go wrong! Your choice of a wide variety of rainbow-colors and more. The glitter sticks to the skin using a safe and hypo-allegenic, non-toxic, non-latex-based body-adhesive that is made especially for the skin ONLY. These water-resistant tattoos take a couple of minutes to apply, yet can last up to 7 days – even after swimming! 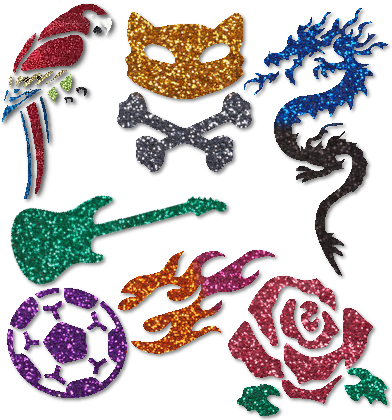 If necessary, Glitter Tattoos can be easily removed with rubbing alcohol or baby oil. Also, we have many more designs that are not featured below. Some designs may vary. Mitzvahs, birthday parties, graduation parties, homes, churches, schools, corporate, reunions, picnics, etc....we can handle it. Glitter tattoos are HOT!! !